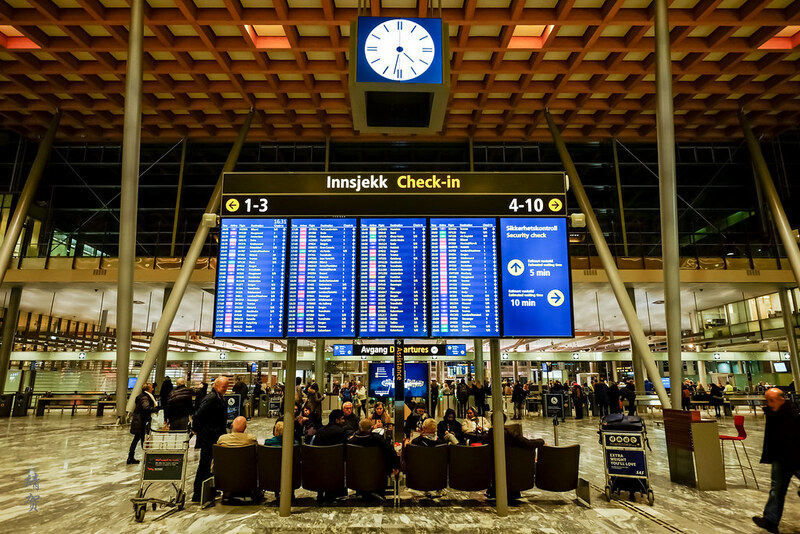 Reaching the airport before 4pm, I had plenty of time before my departing flight out of Norway. I was actually unsure if I could even check-in for my flight. 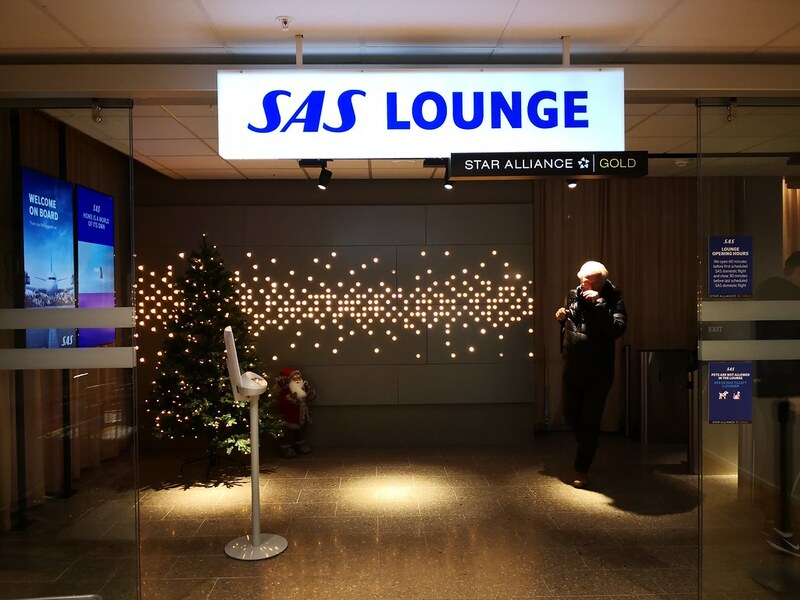 Passengers flying on Swiss check-in from the SAS counters since they are part of Star Alliance. 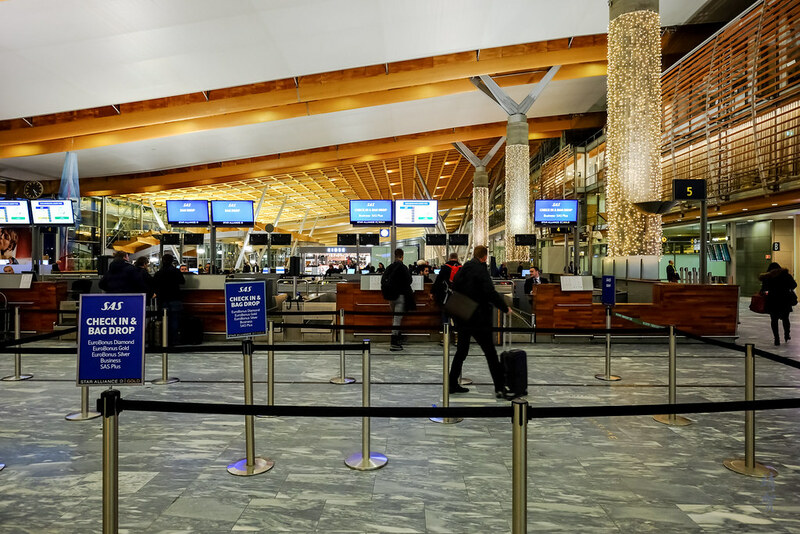 While I was assigned my boarding pass, I was able to use the fast track on the other side since the one near the SAS check-in counters are only for SAS Business passengers. 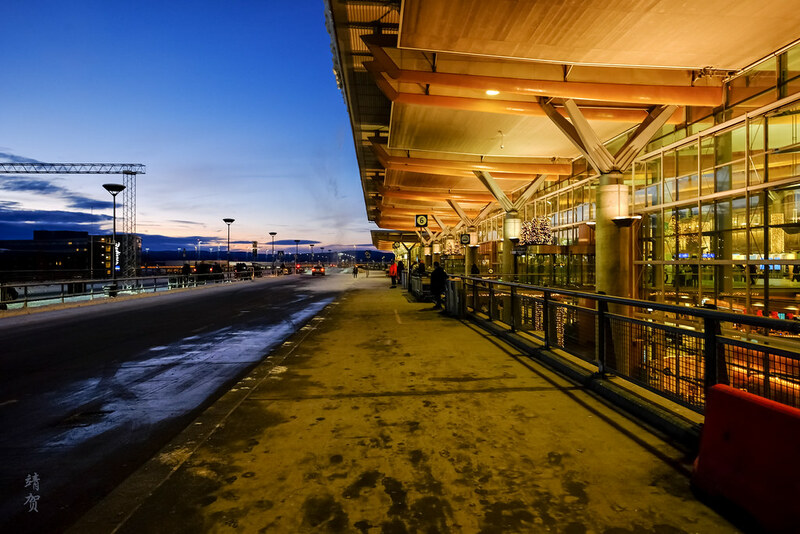 I took the time to explore the rest of the terminal before proceeding for security check as I had plenty of time to spare. Specifically, I wandered over to the domestic side of the terminal which is where passengers exit from the train station. 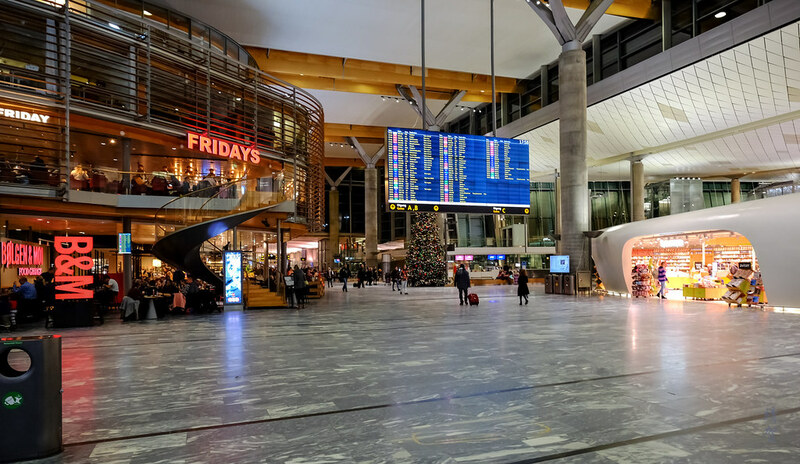 This central atrium has a large departure board which certainly is a great feature to have in an airport. 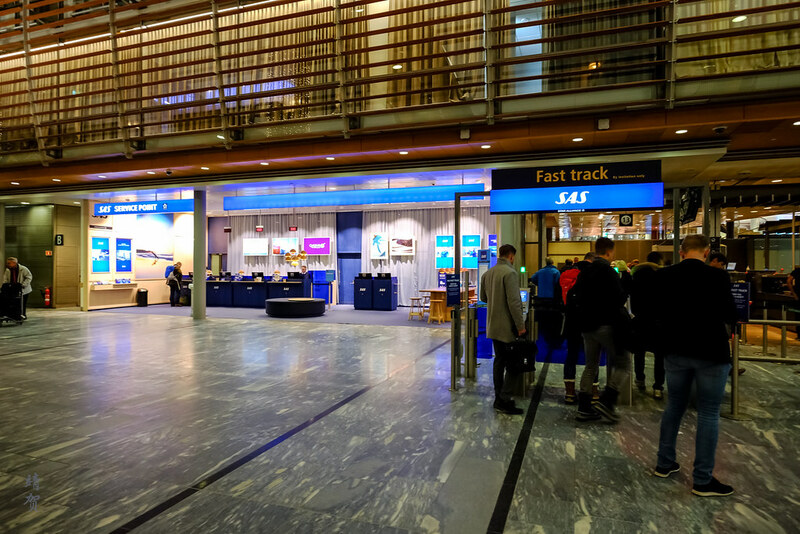 Past the security screening, passengers enter into a central atrium with the amenities most travellers need like a bank for exchanging your excess Krones, a restaurant for dinner and of course plenty of shops to pass the time. 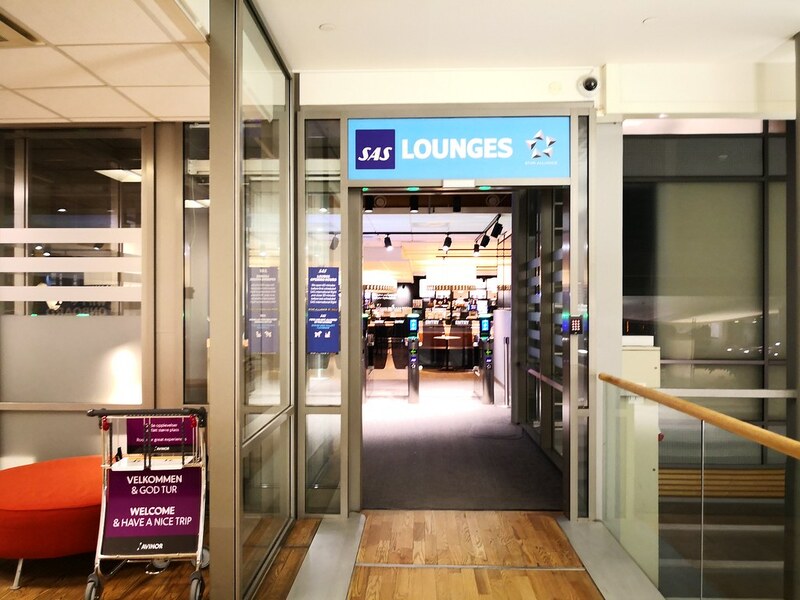 The SAS Domestic lounge was located across from gate A2 on the 2nd floor and is accessible by stairs or elevators. 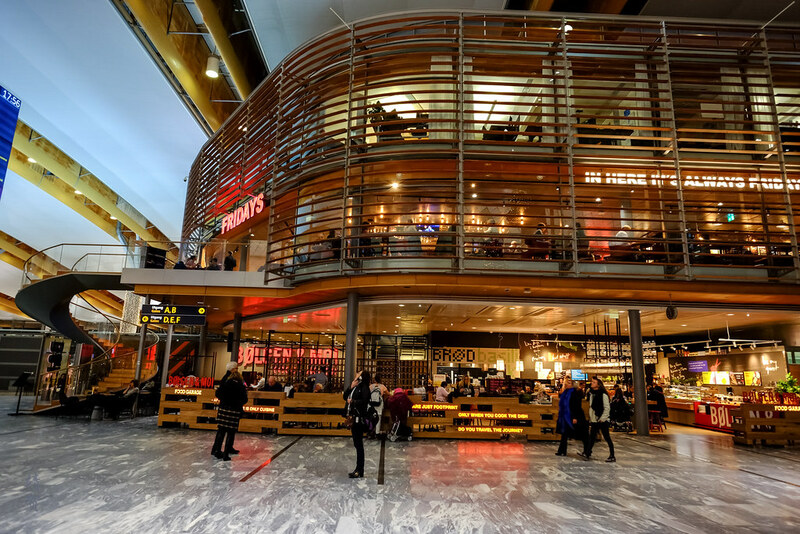 The lounge is actually visible from the concourse as it is beside the TGIF Restaurant. 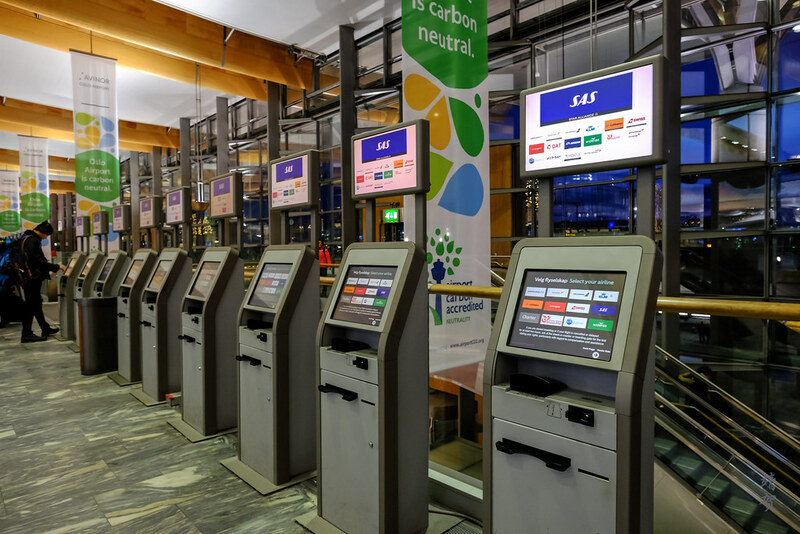 Entry into the lounge was easy by scanning your boarding pass, bypassing the need for a manned reception desk. Once inside, I enquired about using the showers but was told the hot water was out of order. There was several private shower rooms which I did not use at the end of the lounge since no hot water was available. 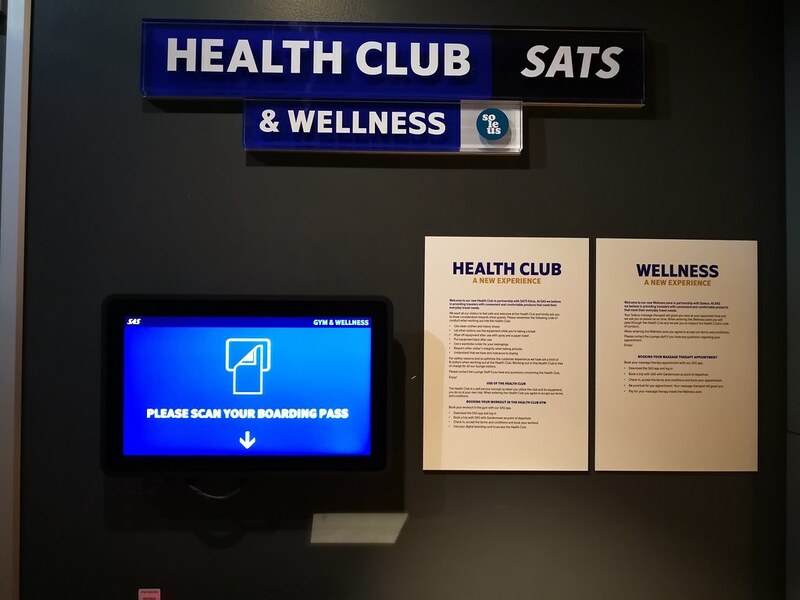 Across from the shower rooms, there is a separate Health Club area that could be accessed just by scanning the boarding pass. 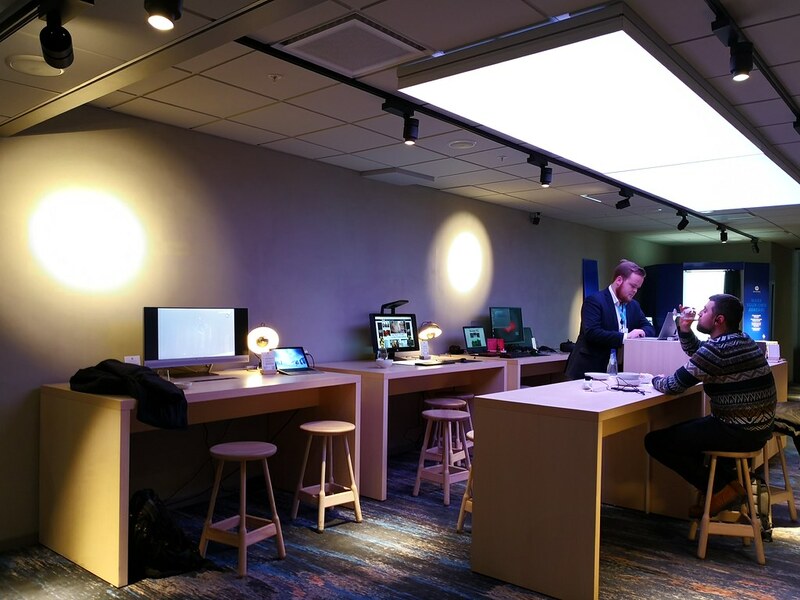 Another separate section within the lounge was an Innovation Hub that comprises of several workstations with a table for guests to work in peace. This section seems to be partly sponsored by HP as there was a ‘Make-your-own-Avatar’ booth where guests could create their own digital avatar. A staff from HP was there to assist lounge guests. This section has some lounge seats as well and was less noisy since it is far away from the main buffet section out front in the lounge. 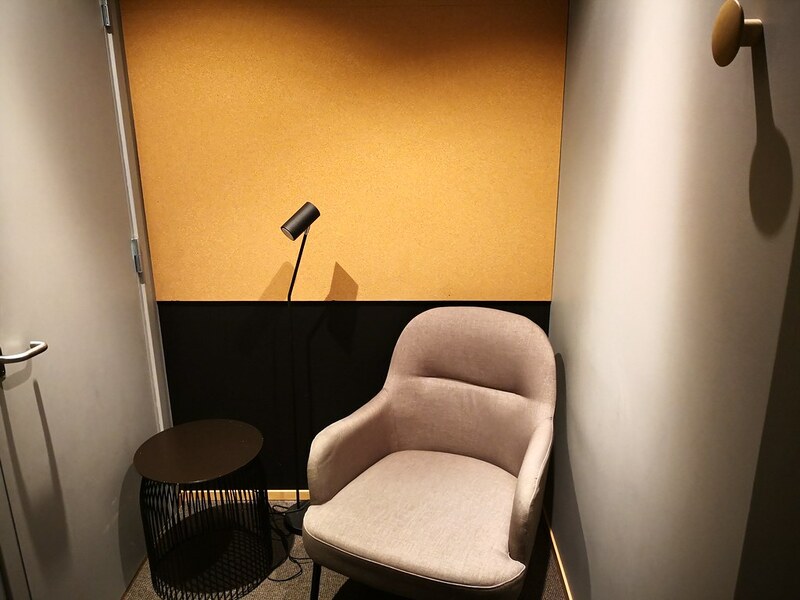 For more privacy, the lounge has a couple of private rooms to make phone calls or work in solitude. Other areas to relax inside is by the fireplace which is an open space next to the dining and buffet section. 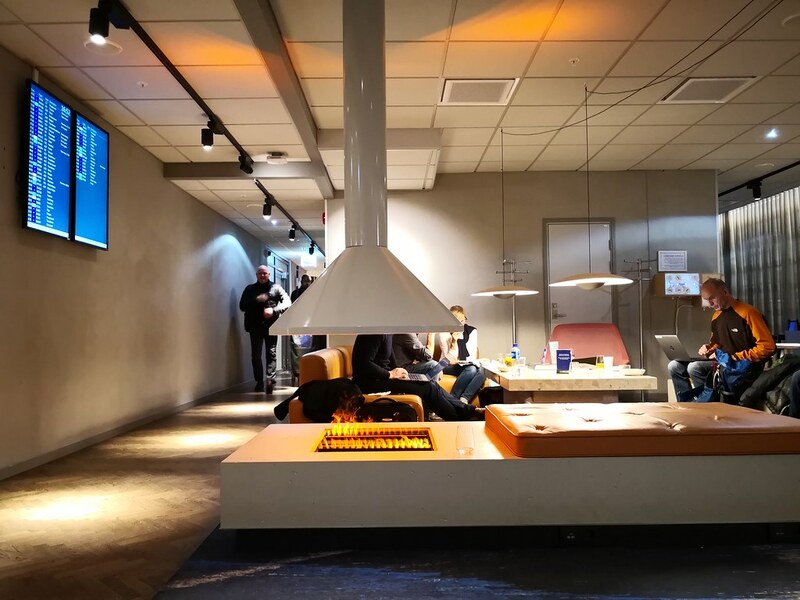 With plenty of informal seating space with armchairs and coffee tables spread around the fireplace, it was one of my favourite spots in the lounge. 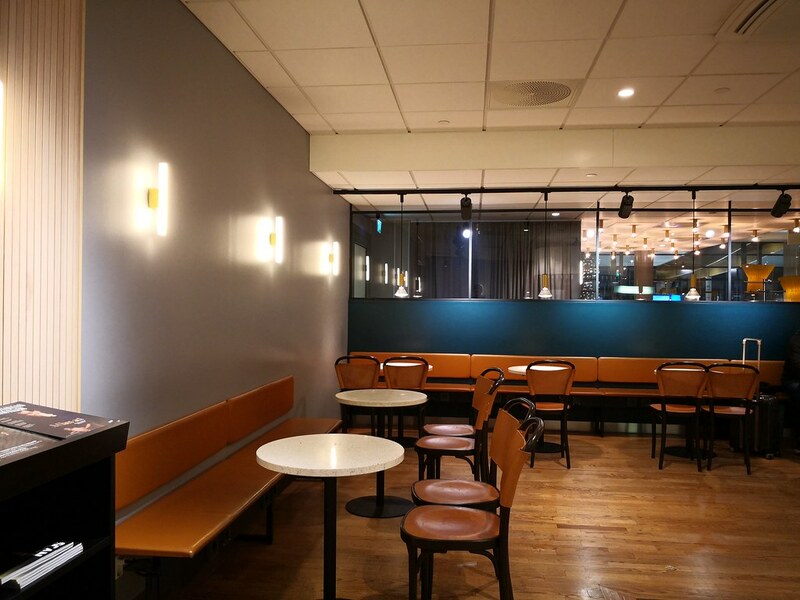 In the rest of the lounge near the entrance, it is taken up mainly by dining booths and communal bar tables with stools. 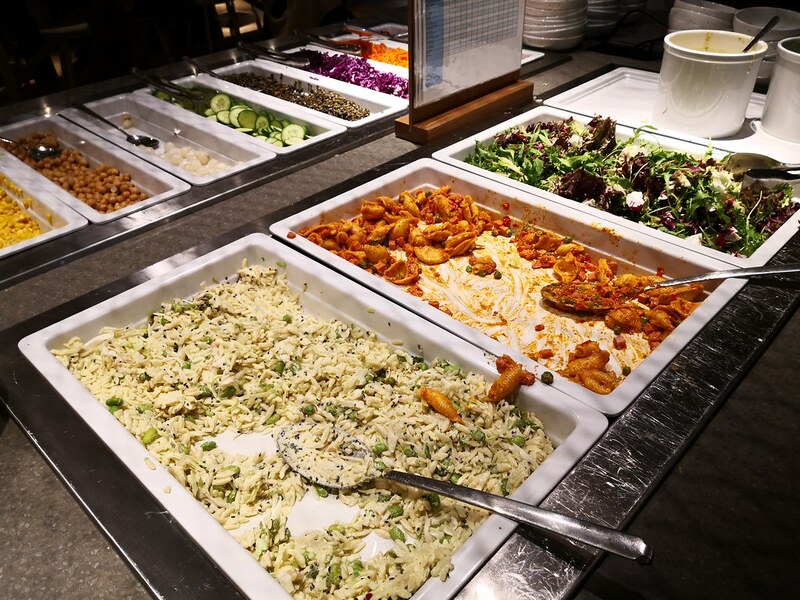 Next to the dining tables is the buffet counter that comes with its own menu. 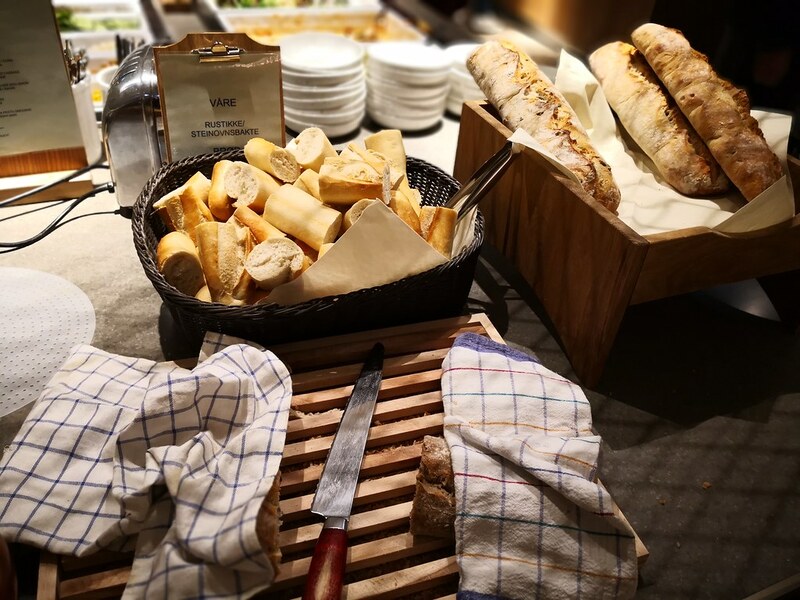 Food in the buffet has a decent selection starting with two types of bread that can be enjoyed with butter or the soup. 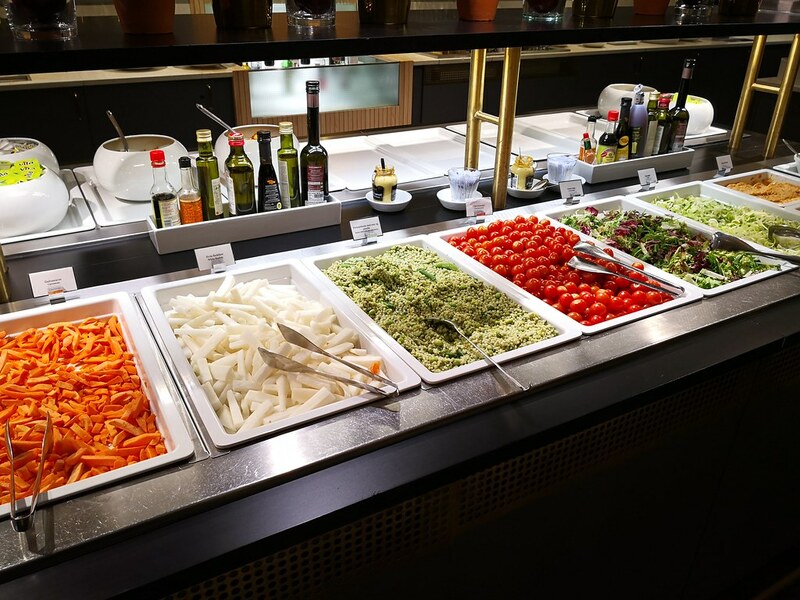 The main food here is a good variety of vegetables where guests could make their own salad. 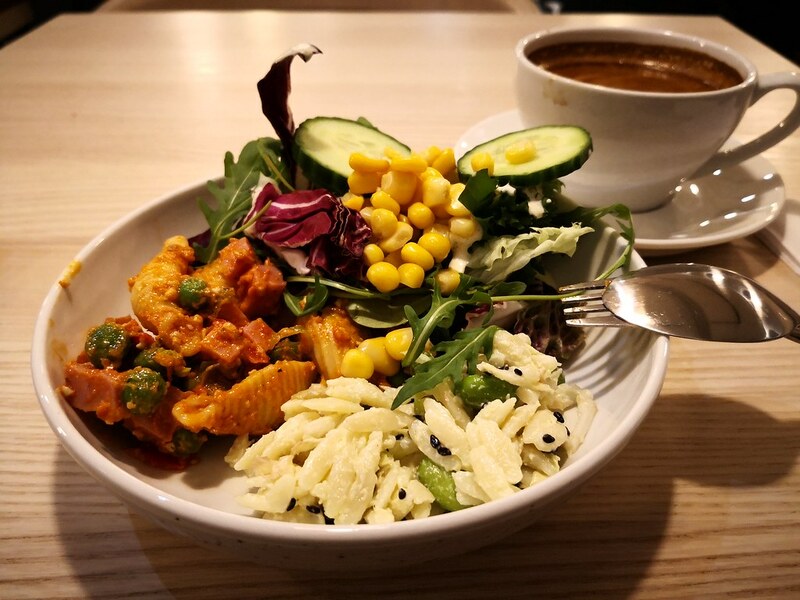 There are two kinds of pasta dishes offered on the counter and on the day of my visit it was red pasta salad with ham or risoni with spicy wasabi. Both were tasty and I helped myself to double servings. 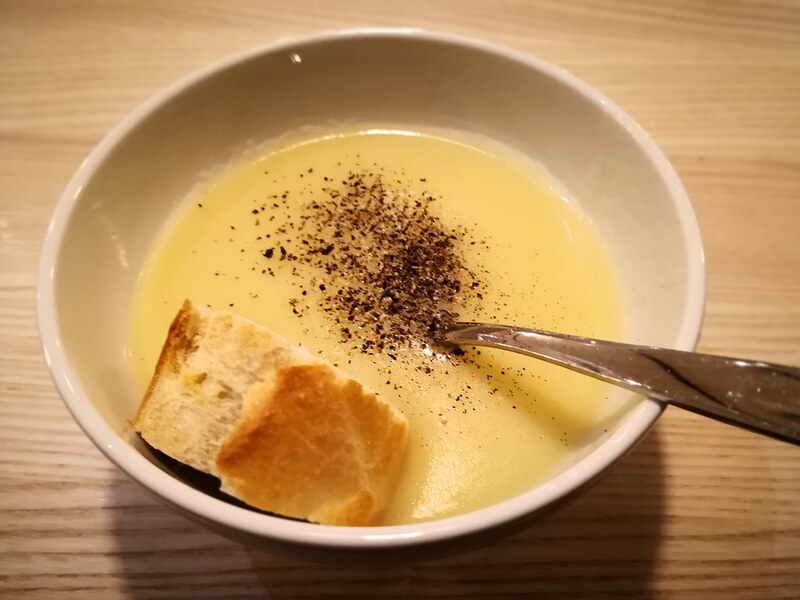 For soup, there was a choice of asparagus soup or tandoori soup and I had the former with plenty of pepper and baguette – just the way I like it. 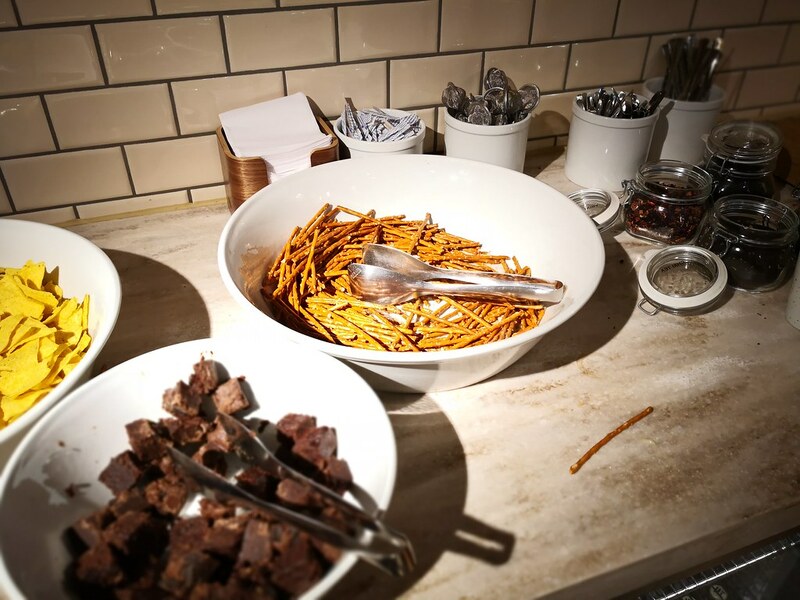 In addition, there was snacks on the buffet counter comprising of nachos, cookies, pretzel sticks and brownie bits. They sure round up a nice buffet area which did satisfy me enough for a light dinner. 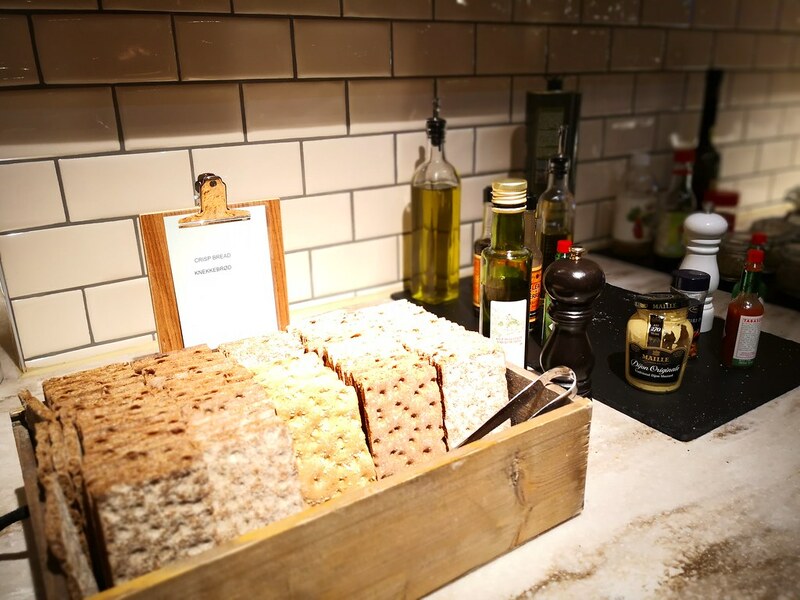 In case guests are left wanting for more, there are always crackers with balsamic vinegar, olive oil, and some other condiments. 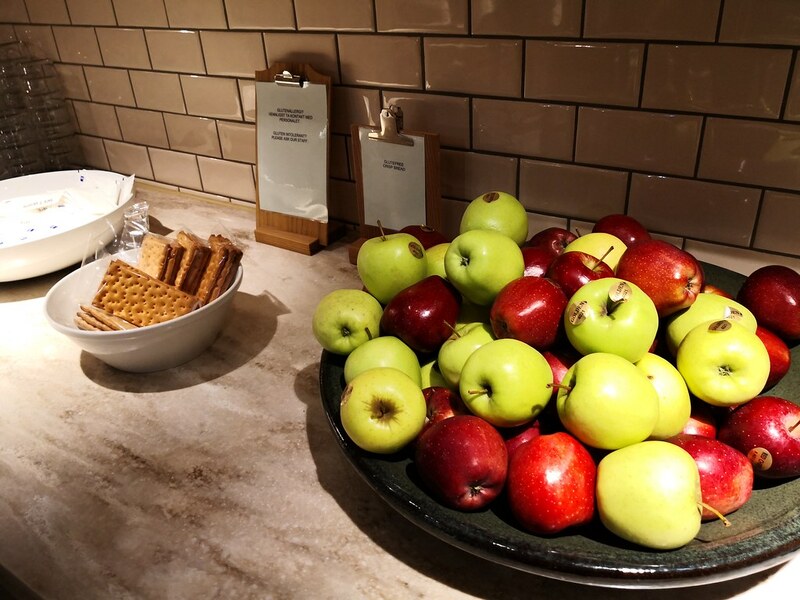 Fresh apples are provided on a big bowl as well on the sides for those who need a quick snack-on-the-go. 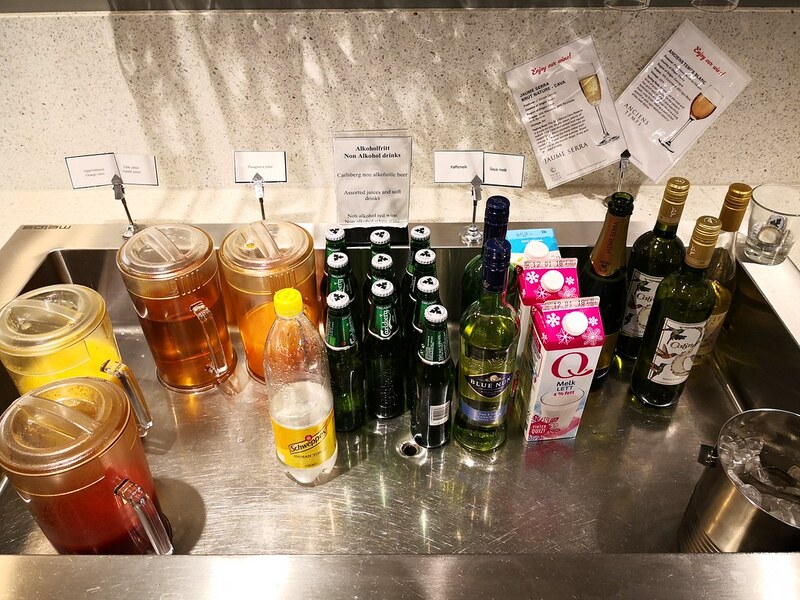 For drinks, there was assorted soft drinks from the fountain, a couple of wines along with two types of beer on tap. 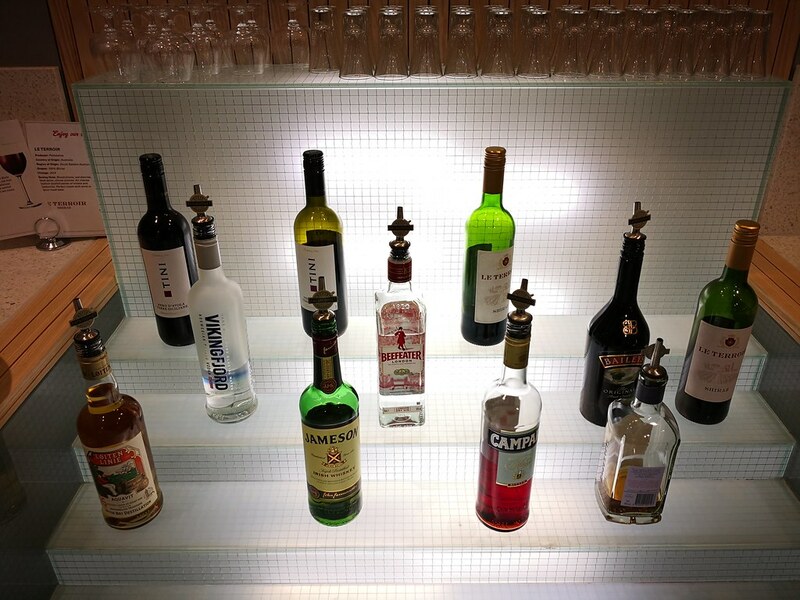 Generally a good variety of drinks as well that is on par with what one gets in most lounges. 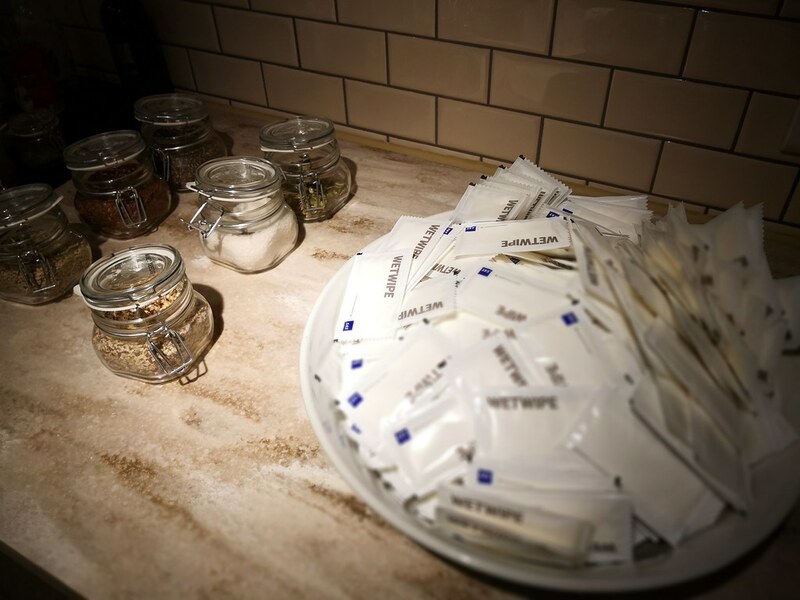 Commonly found in European airline lounges are wet wipes as well making it convenient for dining with hygiene while travelling. They also come in handy for cleaning the airline cabin later so I liked that they are very accessible in the lounge. Even with the crowded state of the lounge, I still managed to find myself an empty table where I could dine comfortably. After the light dinner, I made a stop at the cafe inside the lounge that is manned by a barista. And what made this lounge truly great was the coffee served here. 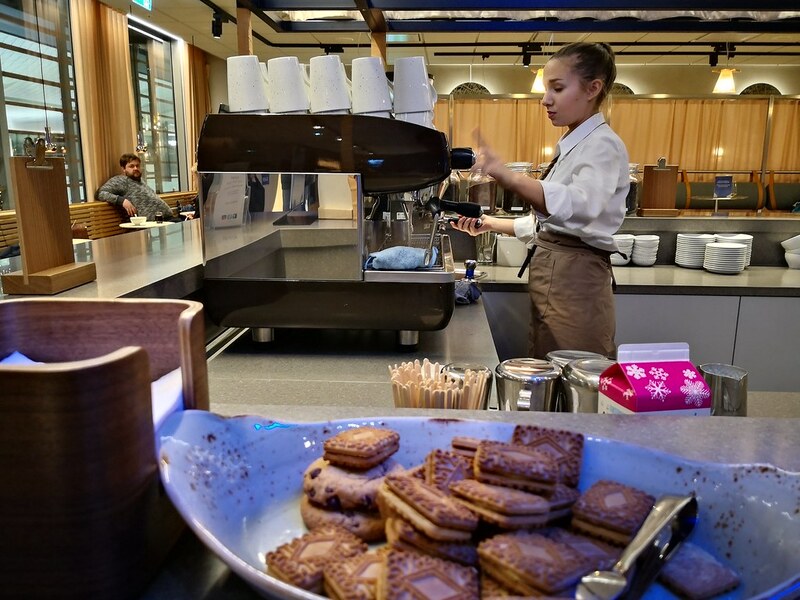 Guests could easily order from several specialty coffees and they sure beats the one made in Starbucks. While I did not get to use the shower, I did enjoy a light dinner with a cup of flat white. Upon leaving the lounge, I noticed a sign stating that only 350 people are allowed to be inside and that entry would be limited if the capacity is full. 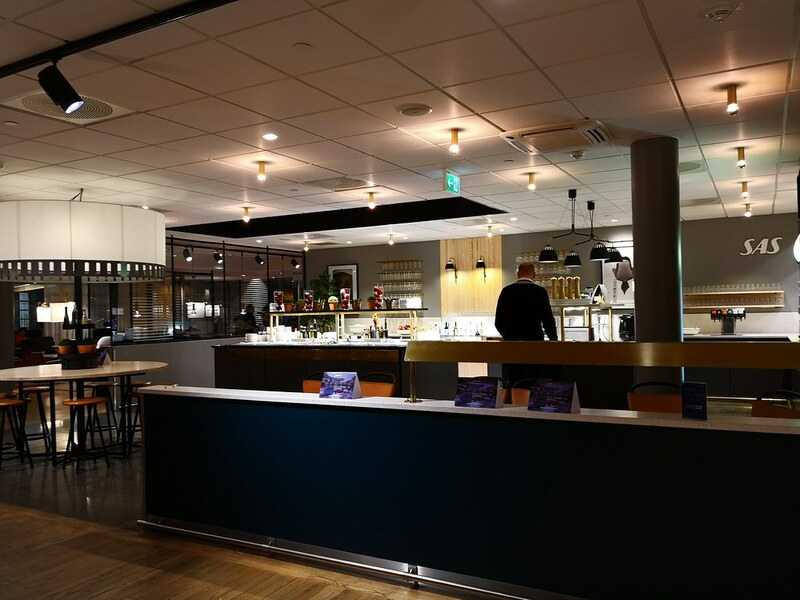 Fortunately for travellers heading out of Norway, there is another choice of lounge to visit. 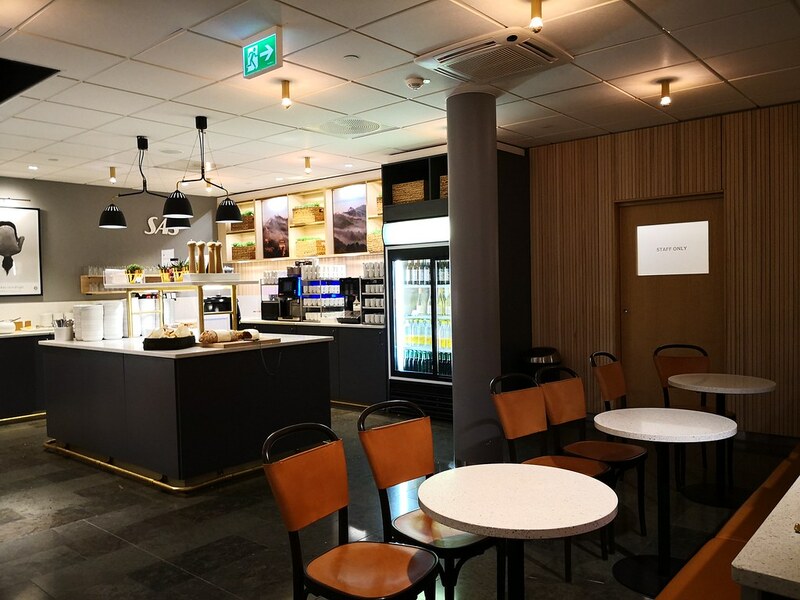 The other SAS lounge for Business class passengers is the International lounge that can be found in the middle of the duty free shops and reached by the elevators next to the Starbucks before passport control. 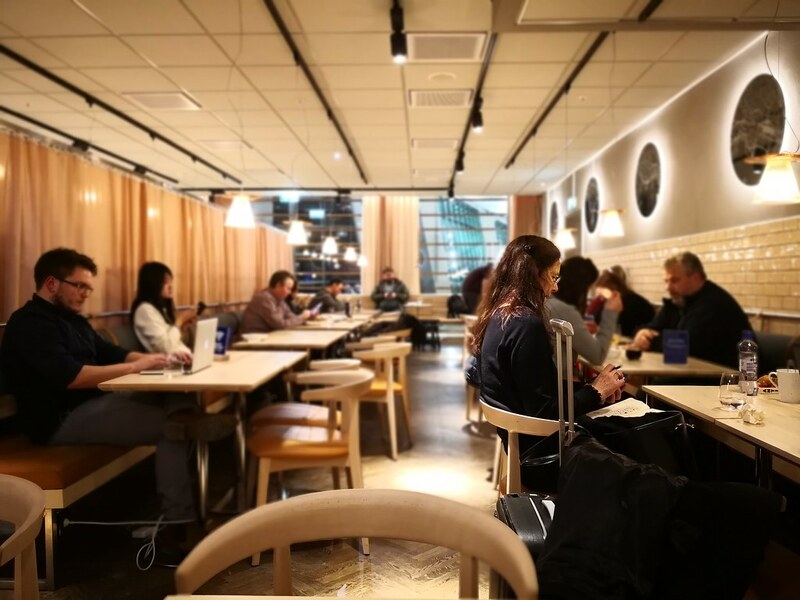 When I checked out the SAS lounge here, the external portion which is for premium passengers is closed and the staff directed me to the Star Alliance Gold lounge which is equally empty but remains open. 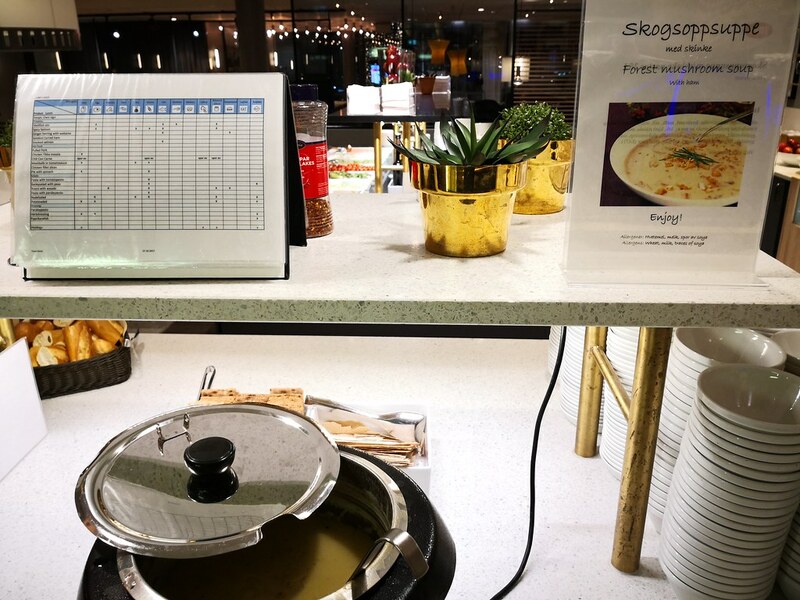 As the lounge was fairly empty, the buffet seems to be incomplete and that might just be due to a limited offering during a low occupancy. To access the lounge, guests similar scan their boarding pass on the turnstile. 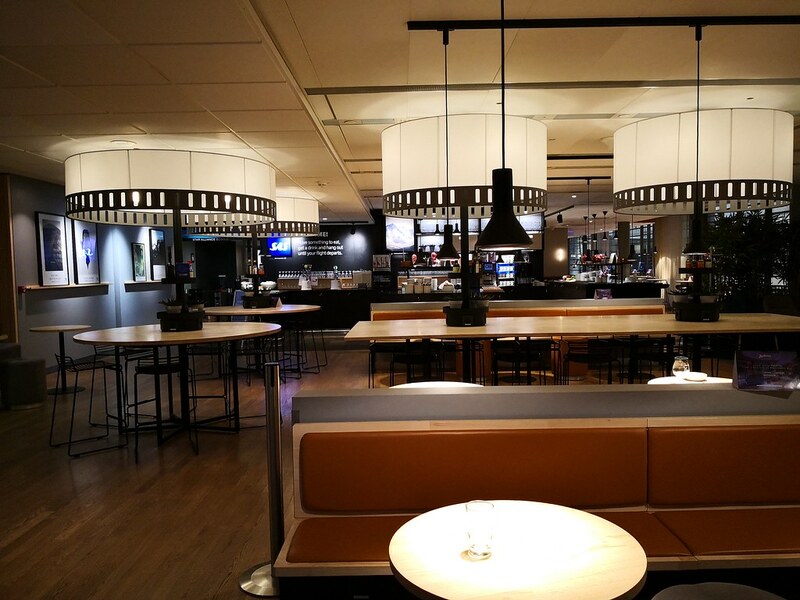 Inside the Star Alliance Gold section, the first section is dedicated to the buffet area with plenty of dining benches. 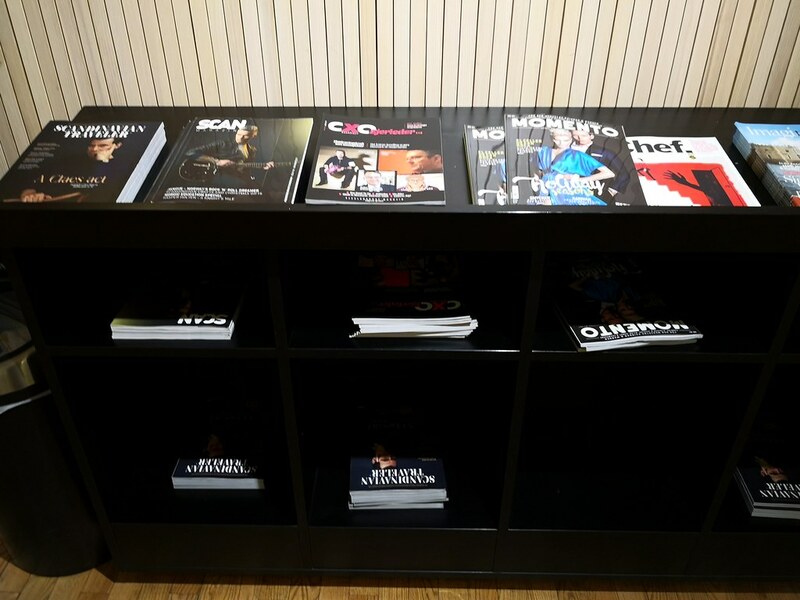 On the left side is a magazine cabinet containing assorted Norwegian magazines. The dining section surrounds the buffet counter with an island in the middle. A beverage fridge with countertop space containing the espresso machines and glasses are by the wall that separates the dining area with the rest of the lounge. 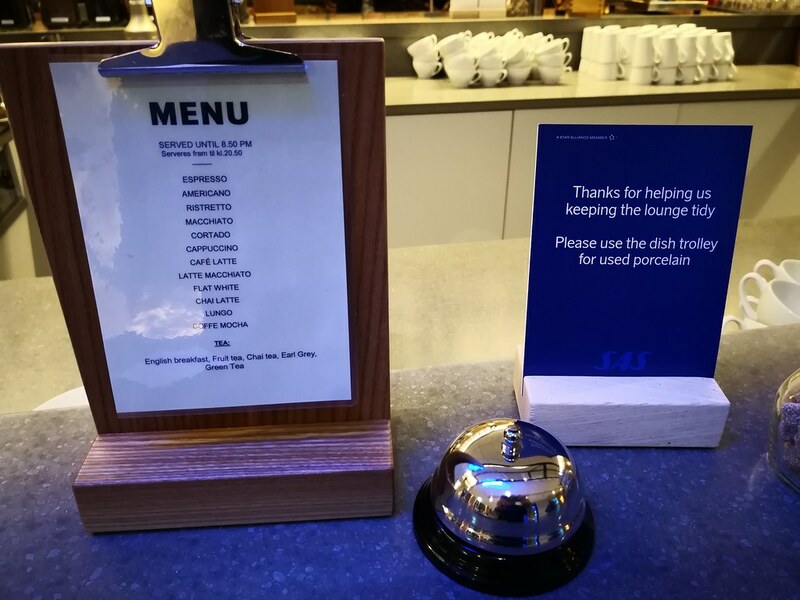 In this lounge, there was only one choice of soup which was a forest mushroom soup. 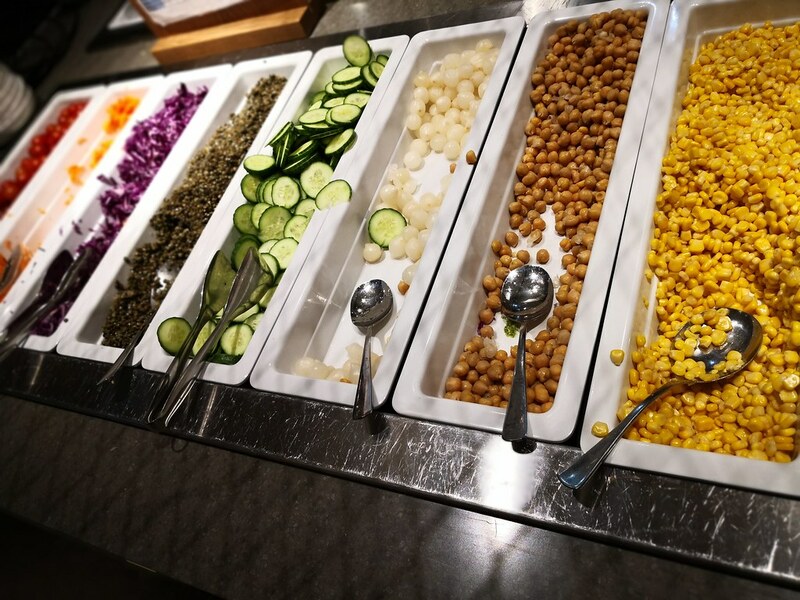 The central buffet island has an array of fresh vegetables though the variety is somewhat different than those in the Domestic Lounge. 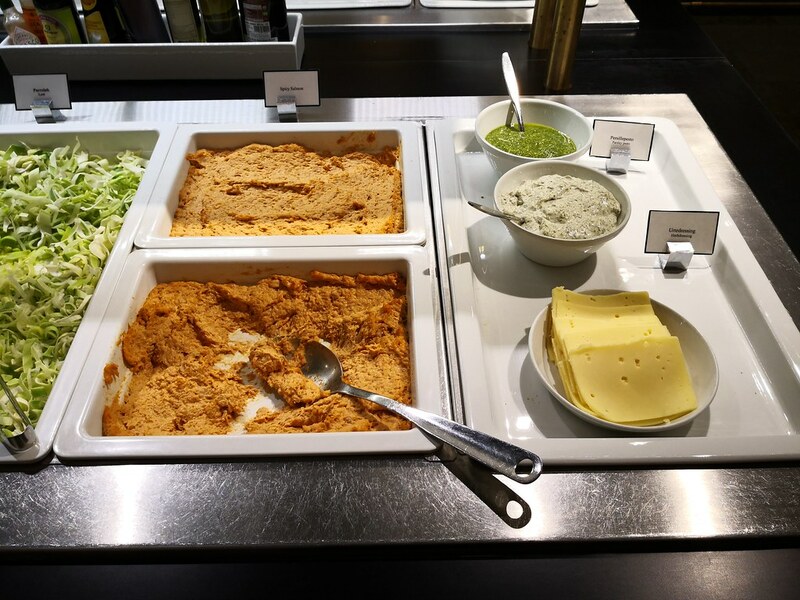 At the end of the salad bar was some mashed salmon dish that came with some dressing and cheese. I wonder if these were supposed to go with some kind of toast to be made into a sandwich? 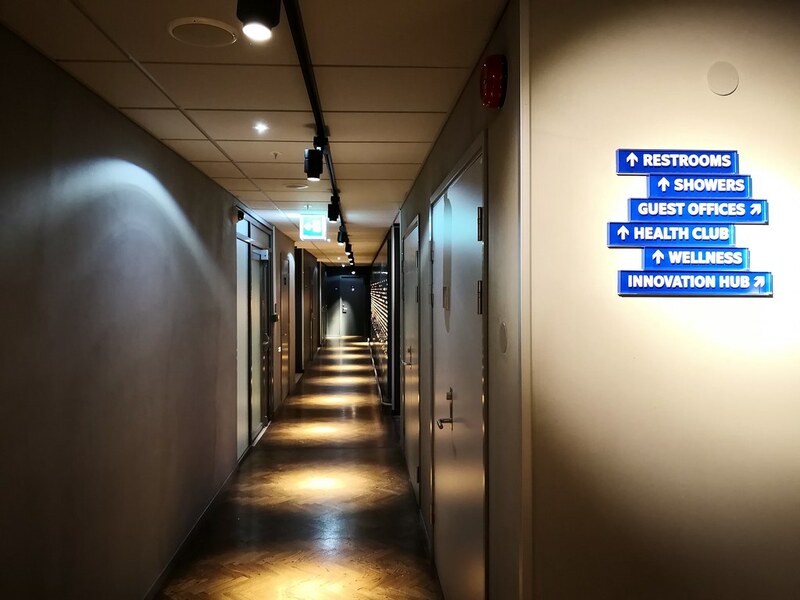 I would never know since I was not too keen to try it out after the light dinner at the SAS Domestic Lounge. 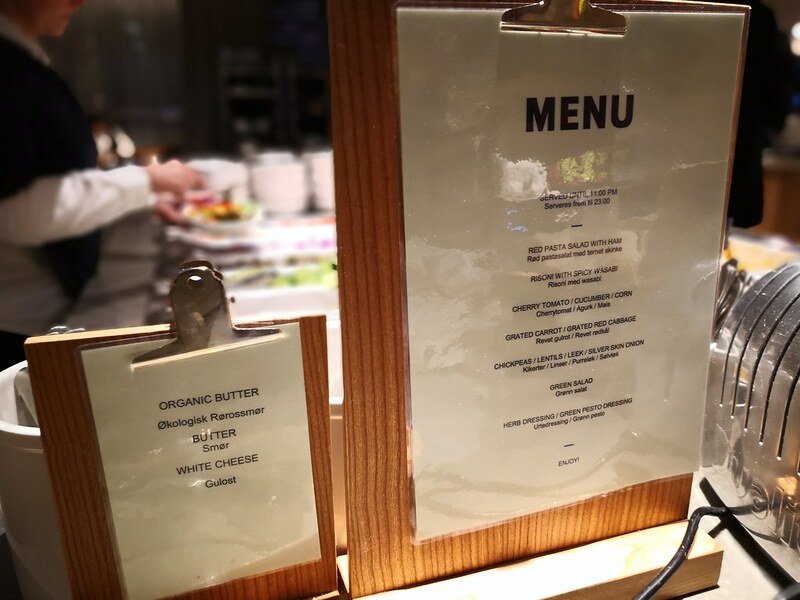 On the other side of the buffet island, there was several empty platters which indicated the limited food offered in the lounge due to low occupancy. 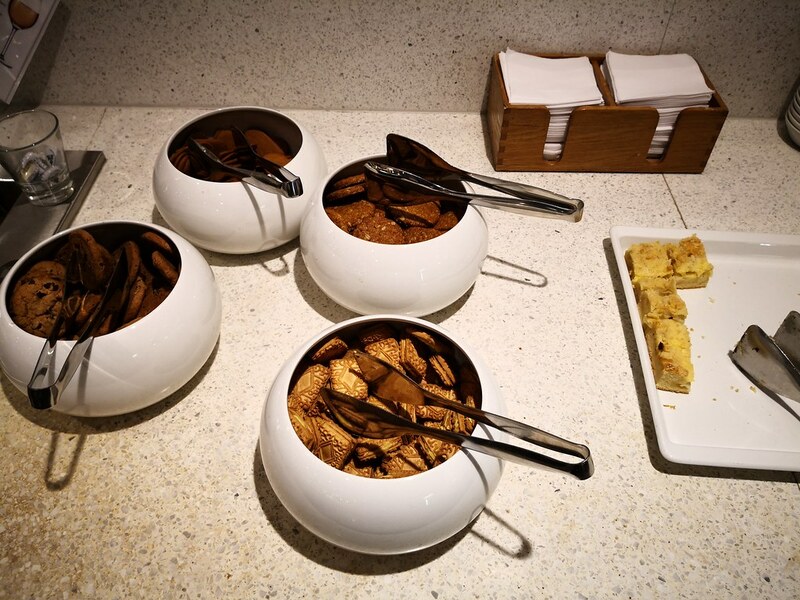 The other section was filled with pretzel sticks and croutons to add to your salad or soup. 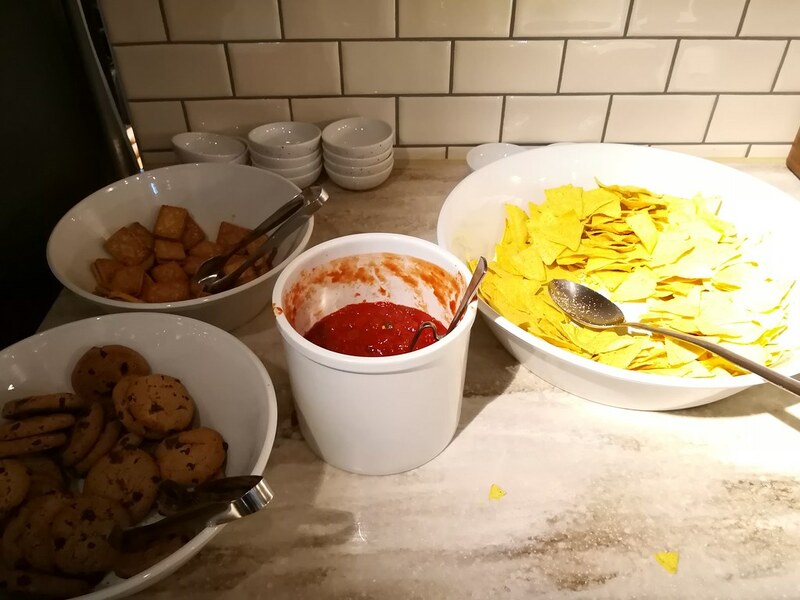 Biscuits, assorted cookies, chips and nachos round up the rest of the food in this lounge when I visited around 7pm before boarding for my flight. 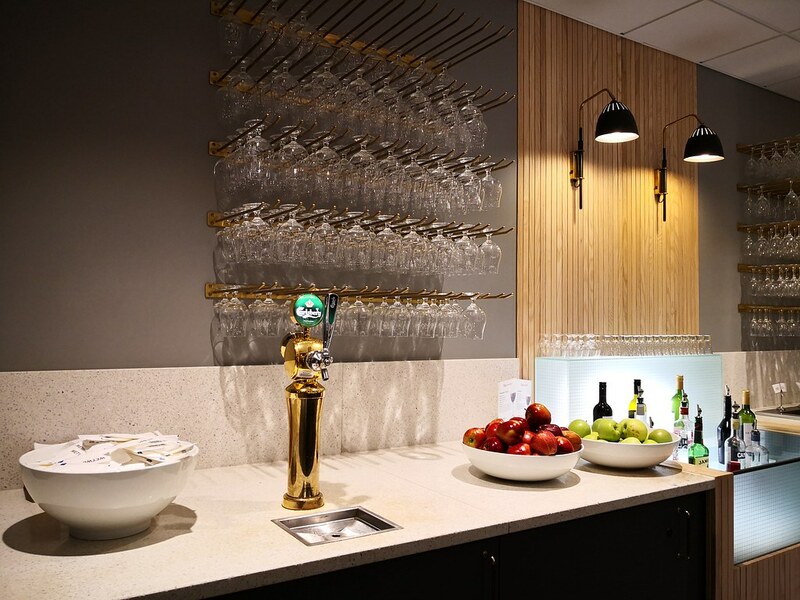 For thirsty guests, the lounge does have the same range of beverages offered. 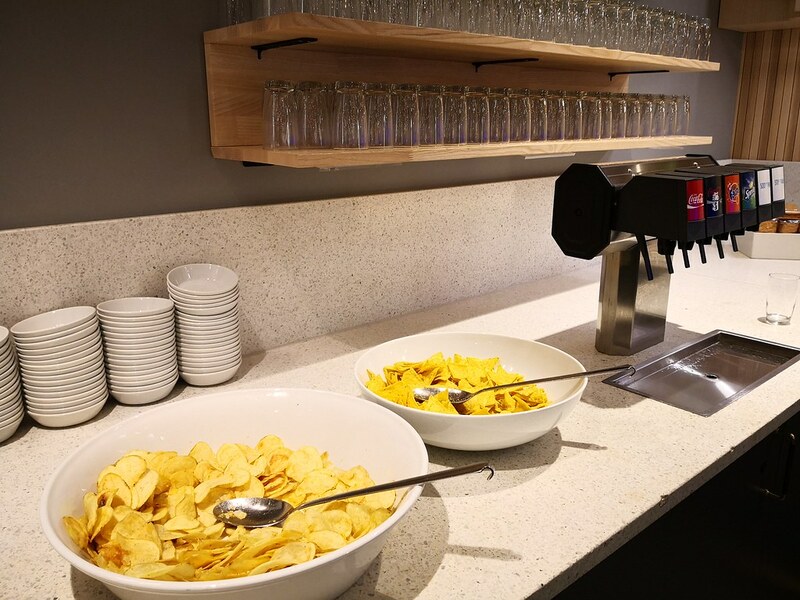 Juices, non-alcoholic beer, milk and soft drinks are available on the countertop by the wall. 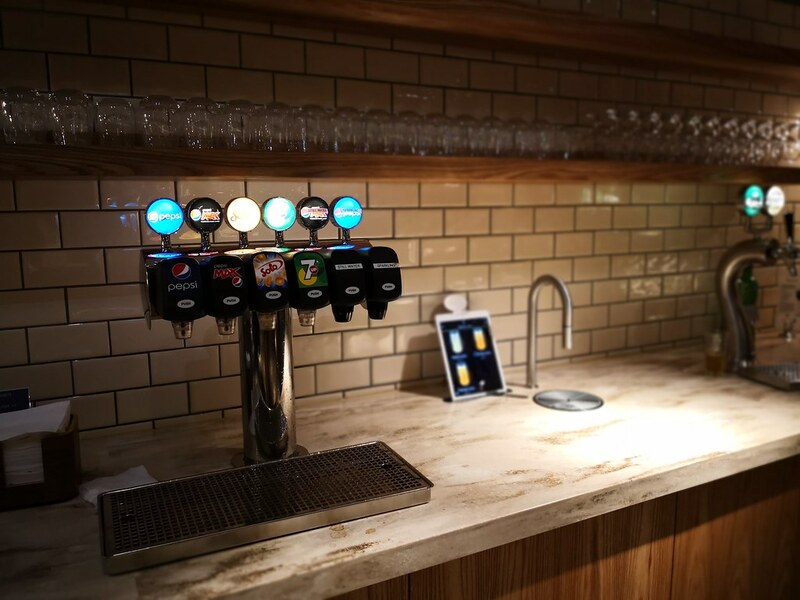 Carlsberg beer is served from the tap while there was a variety of liquors on the shelf with white wines and bottled beers placed in the fridge. 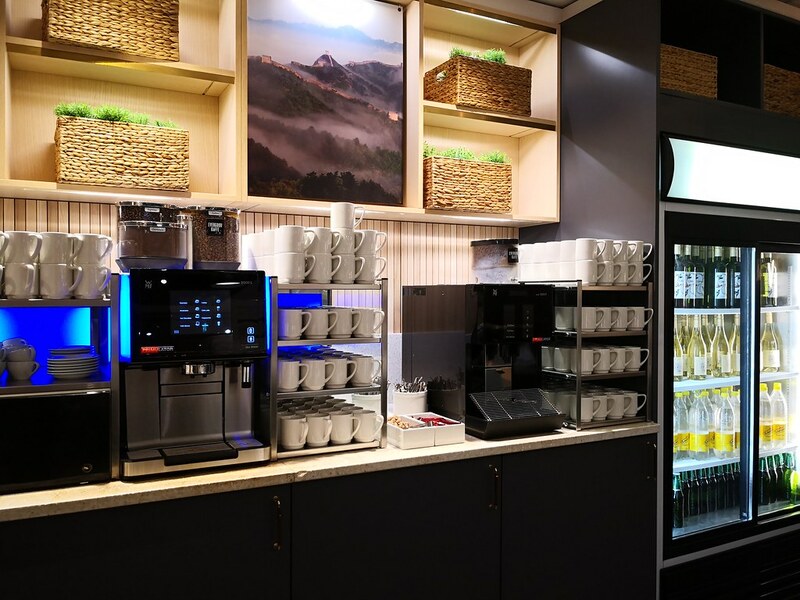 Two espresso machine is provided for guests to prepare their own cappuccino though it was a lower standard of offering compared to the well stocked cafe in the Domestic Lounge. 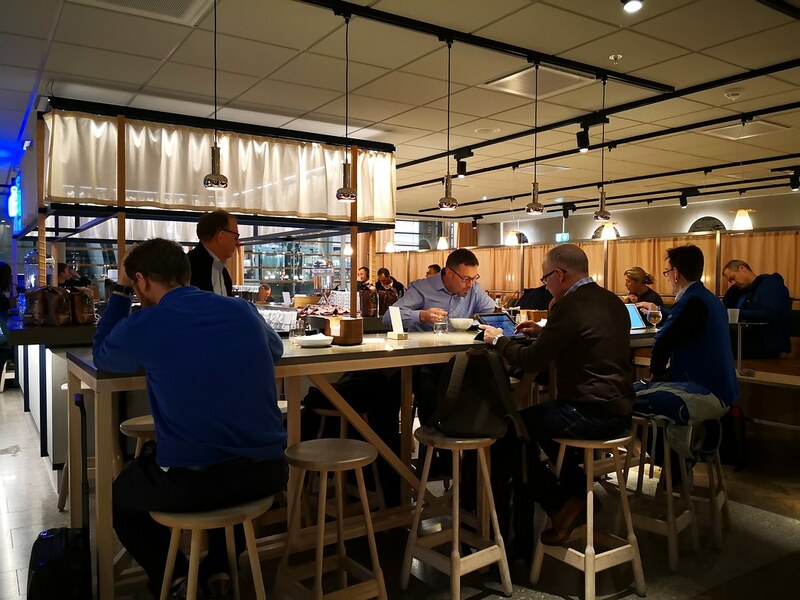 The buffet area has a communal round table with several stools around it for solo travellers in case the rest of the tables for dining is full. Moving to the lounge proper, there seems to be a larger space for relaxing and sitting down to read or work here. 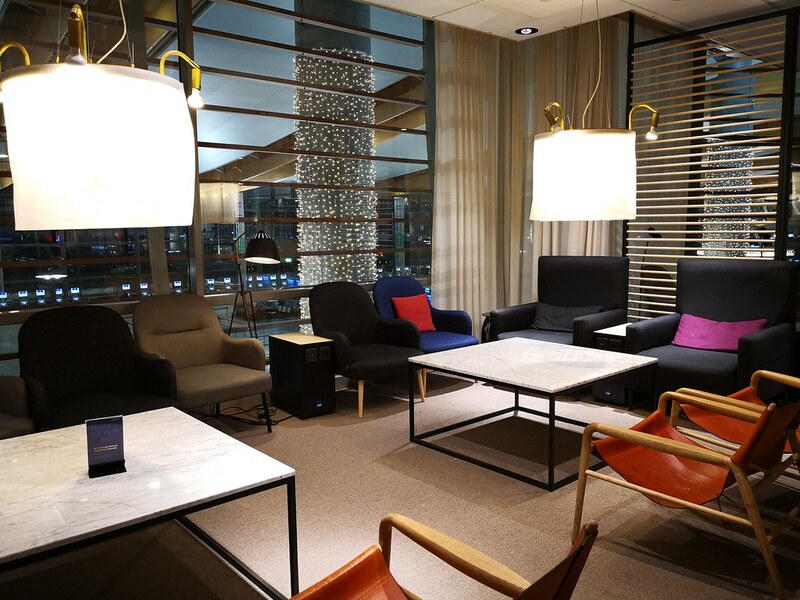 In the communal lounge area, the armchairs have their own reading lights with coat racks placed strategically around the lounge making it convenient to hang one’s winter jacket leaving more space to sit down. 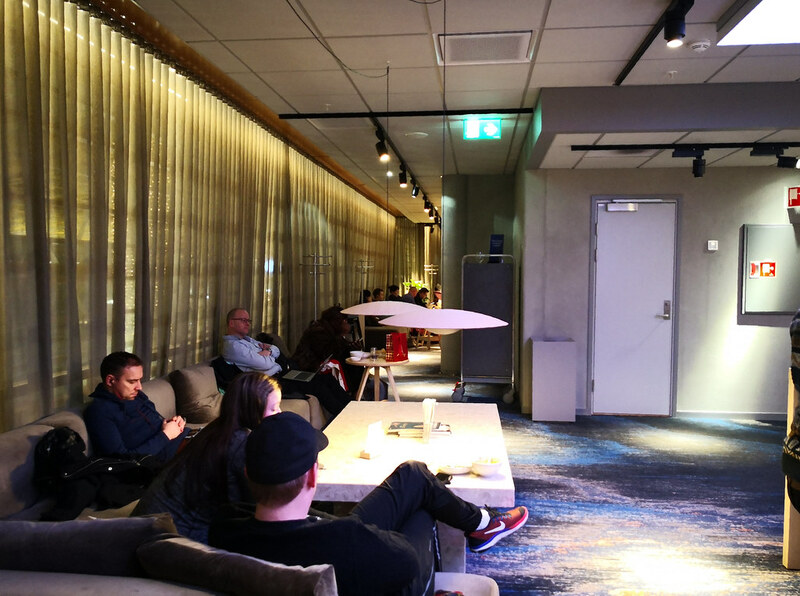 One thing I like about this lounge is the comfortable oversized armchairs and the variety of chairs and sofas that would ensure people get to sit in something they enjoy. 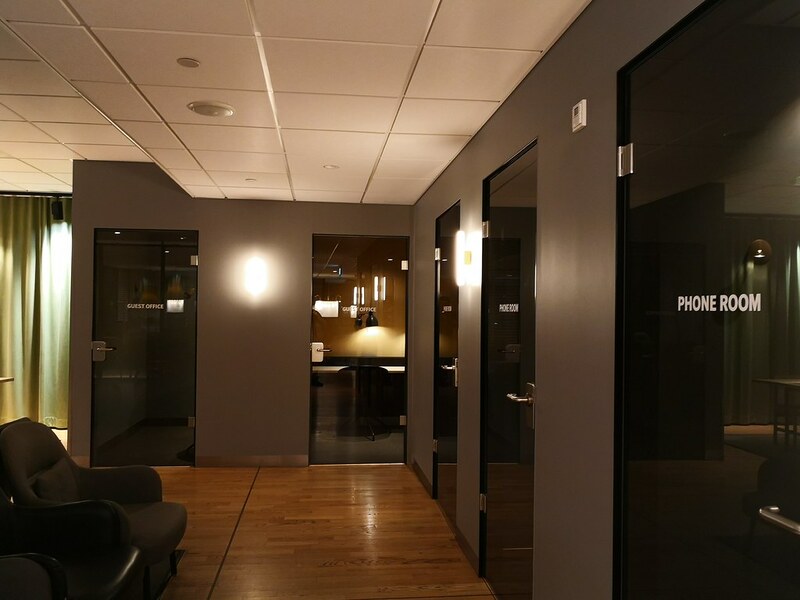 On one side of the lounge there was several private rooms for making phone calls. 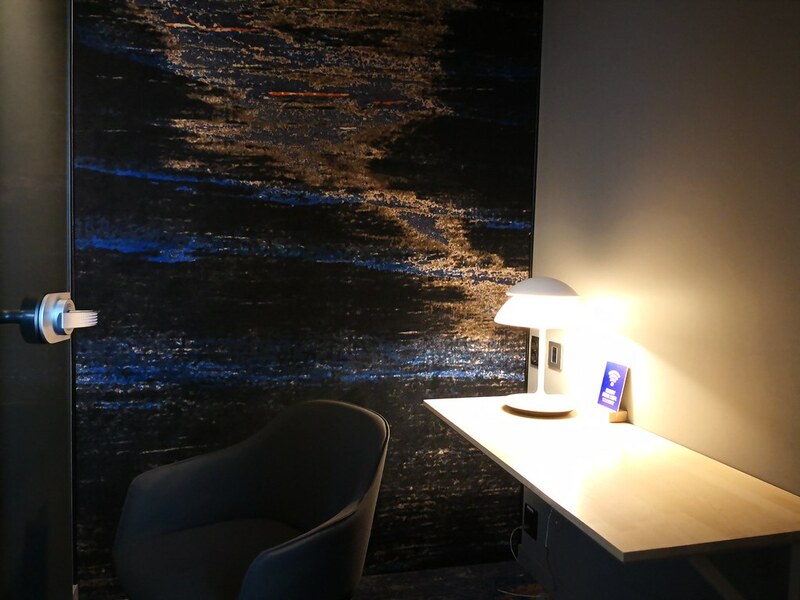 These private rooms come in handy for guests seeking some quiet corner to read as well since they are equipped with a side table, coat hooks and a reading light. 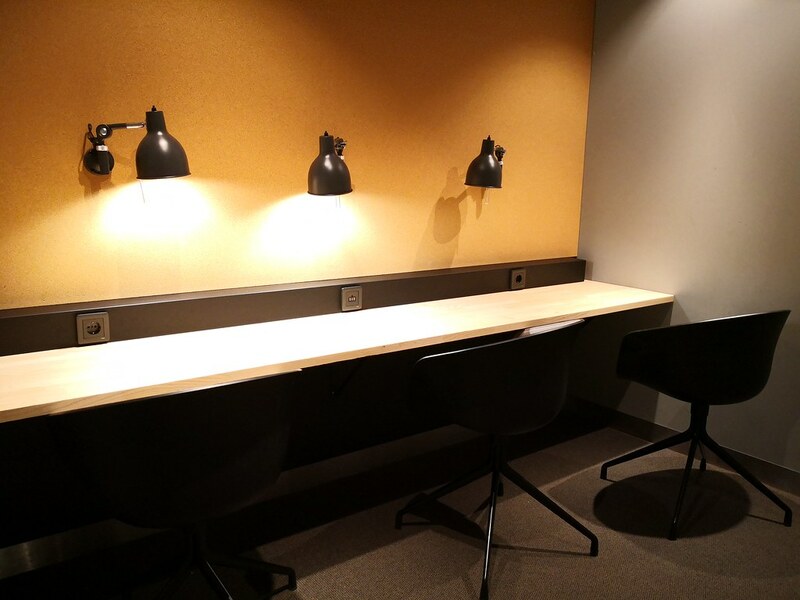 At the end of the private rooms there was plenty of working space in the enclosed office rooms where there are several seats with a cantilevered desk and power outlets for every seat. 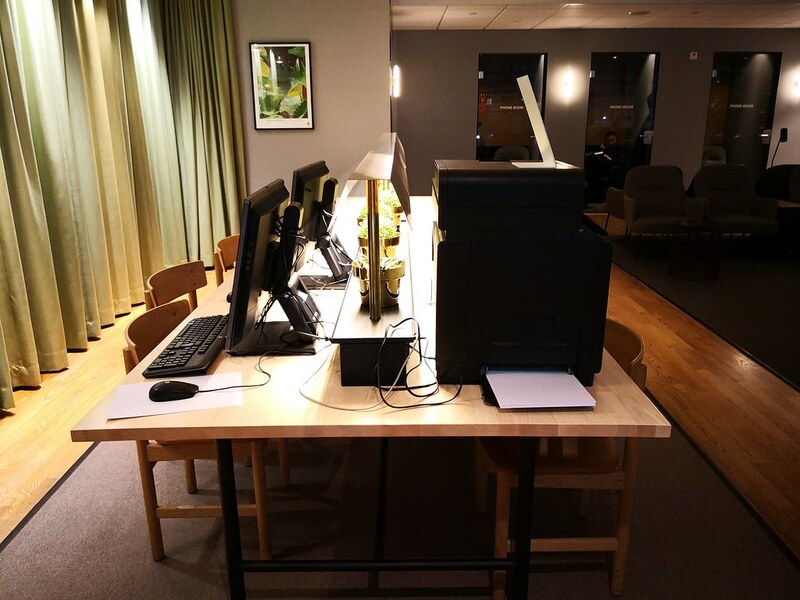 There is more working space outside in the main lounge at the corner end that comes with 2 PC workstations and a printer for guests to use. 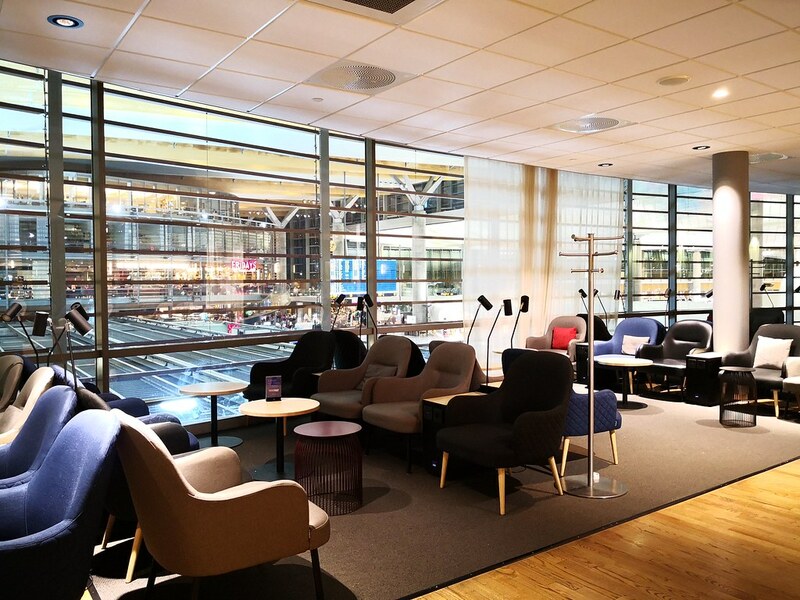 Beside the workstations, there was lounge chairs facing the window that overlooks the terminal hall. 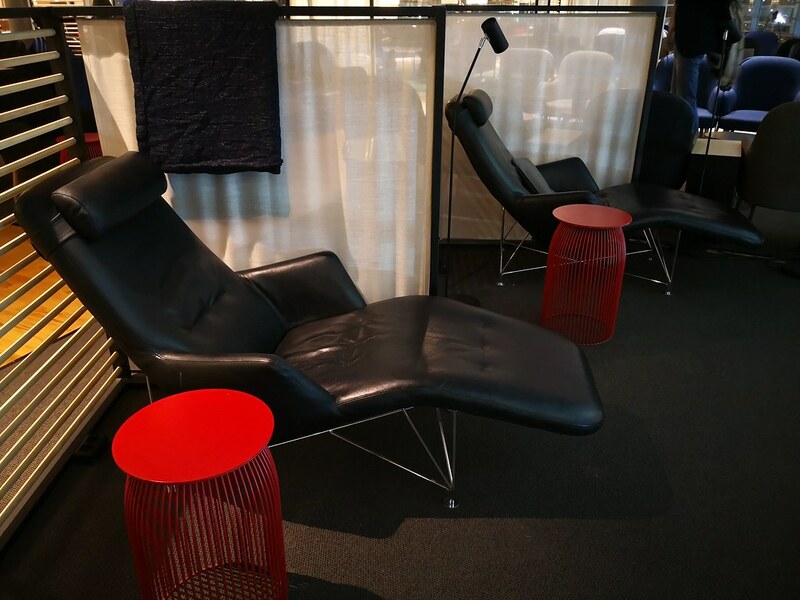 These lounge chairs are shielded with translucent curtains and furnished with a side table, providing a semi-private area for a short nap. I would definitely get a seat here if there was plenty of time before my flight. 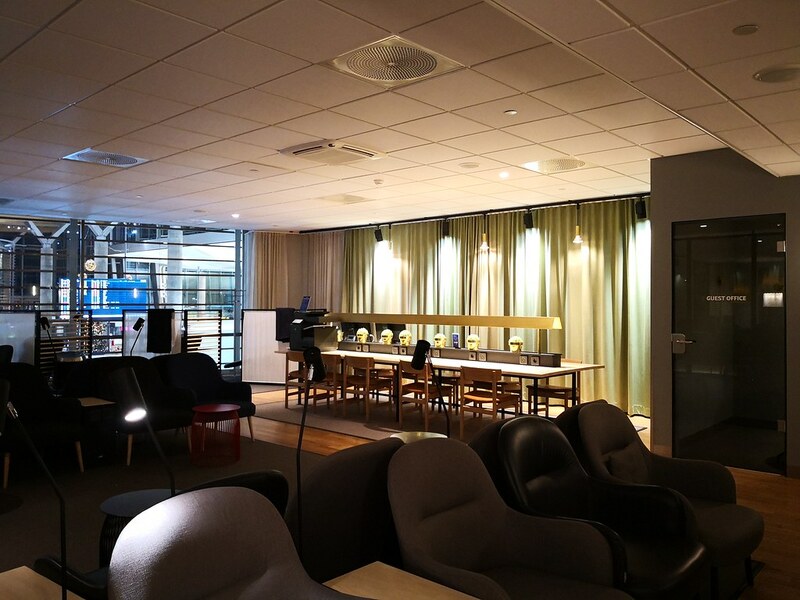 For relaxing without eating, the SAS Gold Lounge was a bit nicer due to the segmentation of the seating space. With well placed amenities like coat racks and power outlets, the mix and match furnitures were even nice for choice of seating. 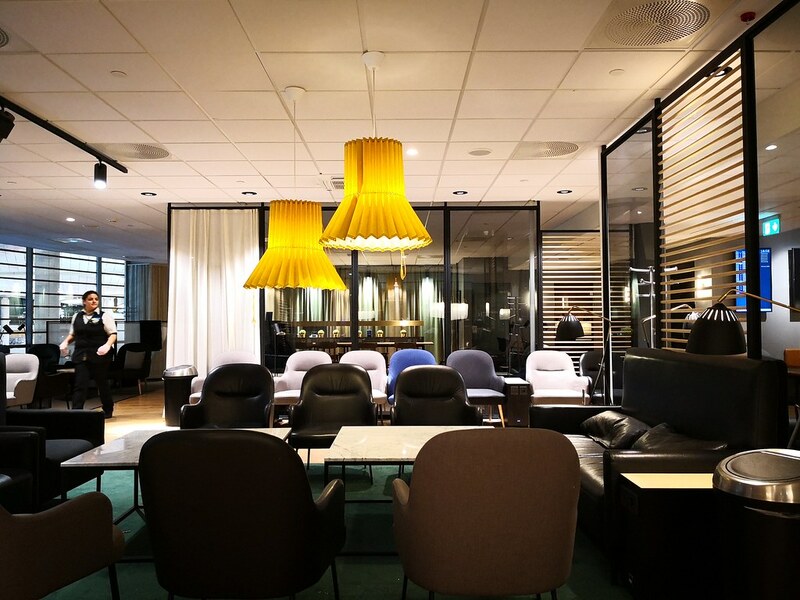 In particular, the private rooms and lounge chairs are amazing for resting before the flight. 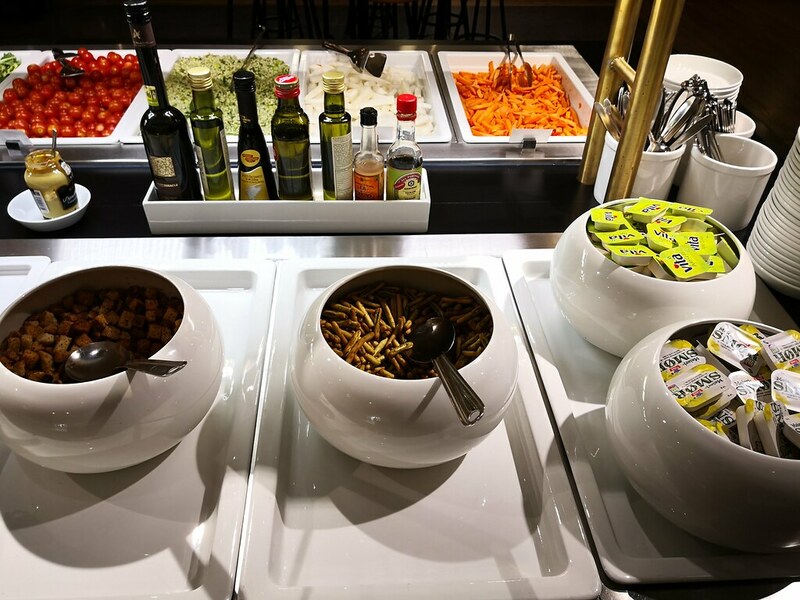 However there is no showers in this lounge and the food seems to be better in the SAS Domestic Lounge. 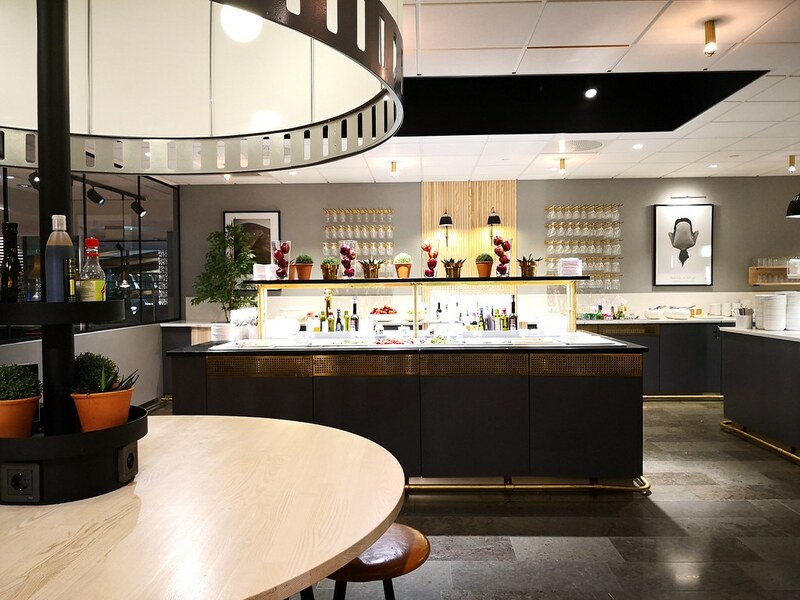 Thus, if travelling in Business Class to other European destinations or Internationally, one could perhaps stop by for food and shower in the Domestic Lounge before relaxing in the SAS Gold Lounge. 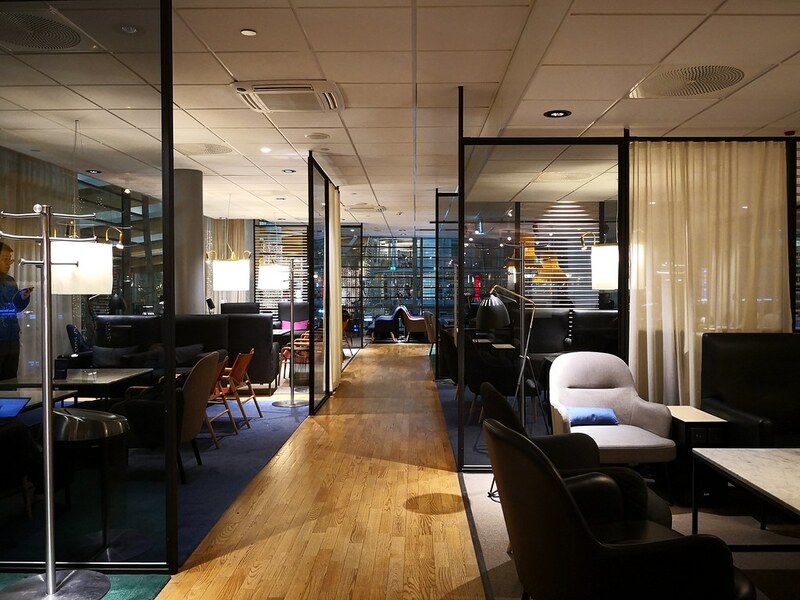 All in all, Oslo’s airport is pretty neat with both SAS lounges that should come in handy for Star Alliance travellers.